Shelton, CT, June 26, 2017 – Centrix held its annual Employee Appreciation Day event in June at its corporate headquarters in Shelton, CT. This event recognizes the hard work and dedication of Centrix's employees in creating the success that has powered the company for over 45 years. For the first time, all Centrix employees, including its remote U.S. and International sales personnel, were able to attend and participate. As part of this event Centrix recognizes long-standing service to the company with Service Awards. Sandy Gallo, Director of Customer Service and Contracts Services, was recognized for 20 years service with the company. The Centrix 2017 Employee of the Year is Carmen Colon, who works as a Quality Assurance Inspector and is known for her outstanding support of her colleagues as well as her dedication to high-quality product performance. A highlight this year was the Dunk Tank where employees purchased tickets to dunk President William Dragan, Jr., Barry Hardman, Vice Director, Operations, and Robert Nordquist, Vice President, Sales & Marketing. This event plus raffles raised over $1200 for Give Kids A Smile through America's Tooth Fairy. Dr. William Dragan, founder of Centrix, said "this is a wonderful day with our employees where we can share fun, sunshine and good food. And what could be better than a pig roast by our own Barry Hardman. Centrix has prospered over 45 years due to the dedication and support of our great employees." Centrix is a leading innovator of dental materials, preventive products, applicators and delivery systems. Along with the Centrix C-R® and Mark IIIp™ syringe guns, we provide the most comprehensive line of syringe delivery systems. We pioneered the first one-piece disposable dental applicator brushes: Benda® Brush and Benda® Micro flocked applicators. Realizing the importance of asepsis in the dental office, we developed the LolliPack® single-use package, which is now the standard application method for fluoride varnishes and other unit dose materials. FluoroDose® Fluoride Varnish has been recognized as the best Fluoride Varnish for the last several years. Centrix also offers the most complete line of Temporization Materials: Tempit® for filling, Access Crown® for temporary Crown & Bridge, and NoMIX® temporary cement. And Centrix is forging new paths in Impressioning with NoCord™ VPS, the first one-step, self-retracting impression material and the Couture™ line of esthetic restorative products. 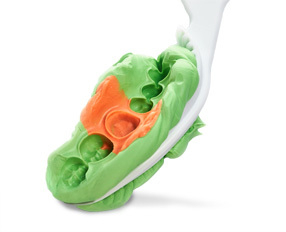 For more information on FluoroDose, and other Centrix innovations, visit centrrixdental.com.